Re: Happy Birthday to members! Oh Paul, I'm slow off the mark today. I'm so sorry. But my wishes are heartfelt. Ah Ivy! Don't worry about that, if no one keeps me informed it would pass by unnoticed. I gave up counting birthdays after reaching 30, probably why I have to ask an embarrassing to my wife of "how old am I today". Seriously! I have to ask an embarrassing to my wife of "how old am I today". Seriously! i don't hope that you have stoped counting 30 years ago aswell. Cecilia... I can't wait for your translation, that'll be fun! Lady C-gull supervises the arrival in the Trondheim fjord of the world’s first environmentally friendly birthday cake, fully equipped with LNG fuelled candles! HAPPY BIRTHDAY, MY FRIEND...., AND MY YOU HAVE THE BEST OF DAYS!!!!!!! Last edited by Sterkoder; July 25th, 2011, 01:29. I will change over to facebook later, because i don't believe you are follwing this thread today, but yes, of course happy birthday also from me!! Yeehaw! 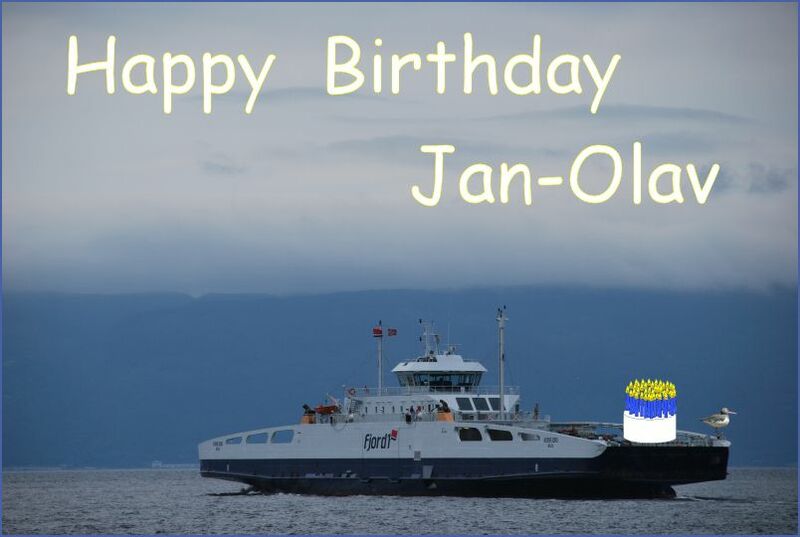 You have a great day Jan-Olav! Wishing you all the best for another year. Congratulations with your birthday today. Last edited by Azimut; July 25th, 2011, 19:58.